Road works finished in the High Street! Just clearing up left to do, then the Christmas lights go up tomorrow evening and we'll be all ready for Walton's Christmas Festival of Lights! The High Street will open to traffic from 8pm on Saturday when we've cleared up after the Festival . Many thanks to Thames Water for working closely with us to make sure this event could go ahead, both by putting on an extra team to get the job done in time, and also by generously sponsoring the event. Hoardings advanced and road completed up to final section. Thames Water still working Saturdays to complete on time for Walton's Christmas Festival of Light, and on course to pull out w/c 21-st November. Pipelaying is up to Churchfield Road now, and the hoardings will be advanced again tomorrow. New Zealand Avenue has been reinstated and the lane restrictions removed. Works will continue for the next 3 weeks and the hoardings and machinery will be removed during week commencing 21st November. ​The water works in Walton continue to be challenging. High risk services, such as gas pipes, run either side of the High Street, and a high voltage electric cable runs down the centre. Limited preplanning can be done as the existing Victorian surface water pipe has collapsed over most of its length preventing any exploratory camera work. 1) A redesign was required on Church St/ Hepworth Way because the new concrete piping was too large to fit between the complex arrangement of existing mains and services. To accommodate this a new system had to be installed across the junction involving two smaller pipes. These pipes were had to be procured at short notice, so this caused a delay. 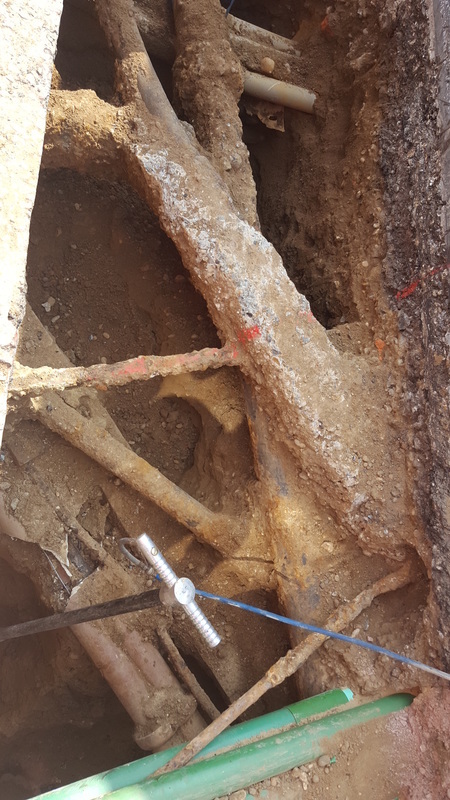 2) During excavation a large chunk of concrete, undetected on the survey, was uncovered and had to be removed. 3) Voids in the ground were discovered upon removal of the tarmac road surfacing. These were formed over the years where ground had been washed into the collapsed brick-built surface water sewer. 4) When it rains, work is delayed where the surface water collects in the excavations where the existing pipe has collapsed. Thames Water are working closely with the town through WoTTA to ensure that both the Remembrance Day parade and the Festival of Light WILL go ahead. As the road works are now delayed by three weeks, they have decided the best course of action would be to add an additional team to start the section of work in New Zealand Ave(junction with Ashley Road) on 3rd October. This will not interrupt the team currently working in the High Street and is planned to be completed in three weeks. In addition they will be working on Saturday 24th Sept and the majority of Saturdays thereafter, in order to advance the programme. The end result is that, because of the additional team, the original completion date of 31st October is back on track. This is fantastic news and WoTTA would like to thanks Thames Water for their excellent communication and proactive approach to find solutions that work for our town. A quick update on the surface water sewer replacement. We are now into the High-Street with the new pipe and are planning to reopen Church Street to allow two way traffic tonight/ tomorrow morning. Bridge Street is nearly complete and will be reopened on Thursday or Friday this week. As you have probably noticed we have established our compound in the High-Street up to where the road narrows. We will shortly be commencing pipe laying in the High-Street and building new manholes as necessary. The work is programmed to be completed by the end of October. 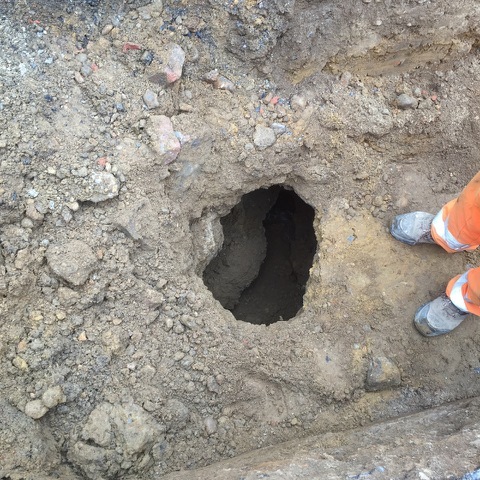 Improving our sewer pipes – Walton High Street. We’re writing to update you on our work to upgrade the surface water sewer pipes in Walton High Street and Bridge Street. Saturday, 8am to 5pm, when needed. So far the work we started on 1 August has not progressed as quickly as planned. We’ve uncovered a number of voids under the road surface in Bridge Street and Hepworth Way which we’re filling in with foam concrete before we can finish working there. The concrete takes around a day to set so this is adding to the time it’s taking us to get the job done. We’re really sorry the job is taking longer than we first thought but it’s really important we take the time to ensure the road is completely safe before it’s reopened. Voids can make a road surface unstable so it’s vital we fill them in. We’ve also had to use shovels to dig in some places instead of machinery so as not to damage pipes and cables belonging to other utility companies. So far our work is around two weeks behind schedule but we’ll keep you updated on our progress. Bridge Street - closed to through traffic between Hepworth Way and the service road will remain closed until early September. High Street - closed to through traffic from 15 August until the end of October to complete our works. Routes along Bridge Street and the High Street are suspended during the road closures detailed above. The southbound bus stop on Church Street will remain closed until works has been completed on Church Street the northbound stop on Church Street will remain open. Please note all of the existing car parks are still open in the area and will not be affected. Please ask our team on site as they’re always happy to help. Or get in touch with us on 0800 316 9800, selecting option one and quoting the above reference number. 13-8-16 : After the first week of work, WoTTA spoke to Thames Water and Costains today and they confirm they are running to schedule. The High Street will be shut from Monday the 15th (as planned) and Bridge Street will continue to be closed for a further week. A one-way temporary traffic light system will be in place at the junction of Church St/Bridge St/High St for (hopefully) one week while work is completed under that junction. Work will continue next Saturday to help make sure this happens. Lots of people have queried why the work is taking so long, or why we can't be given definitive dates about finishing. Thames Water and Costain showed detailed drawings today at their Q&A in the Heart. There are a very complex system of cables and piping under the High Street, above the existing Victorian sewer which is being replaced. This means the work has to be HAND DUG to avoid rupturing any cabling or piping. We'll get a copy of that drawing shortly and upload it so that you can see how tricky the work is. Until they get to the actual area, they are not 100% what they'll find. During the initial dig at the first part of the High Street, they will be completing further exploratory digs along the rest of the High Street to get a better idea of what they will be facing. We will also be uploading a diversion route shortly, to help once the High Street is closed to traffic. This is the route that will be marked by the "DIVERSION" signs in the town. On a positive note, Thames Water has just joined us as a major sponsor of Walton's Christmas Festival of Light! 1) The junction of High Street/Bridge Street will never be totally closed. For one week - 15th to 22nd August - there will be a temporary traffic light allowing for only one direction flow of traffic at a time, through from Church Street to Hepworth Way. At this point Bridge Street & High Street will also be closed so there will be no traffic accessing the junction from those sides. There will obviously be delays, but no total closure of the main through road. 2) It will not affect parking in the town as there is still access to Drewitt's Car park via the Hepworth Way entrance, and Sainsburys and Homebase are unaffected. 3) Worst case scenario for all the work to be completed is end of October 2016. Remember - Businesses will be Open as Usual! Please continue to support our town.